April 7, 2016 by Ecommerce News. About Statistics with tags The Netherlands. 26710 views. 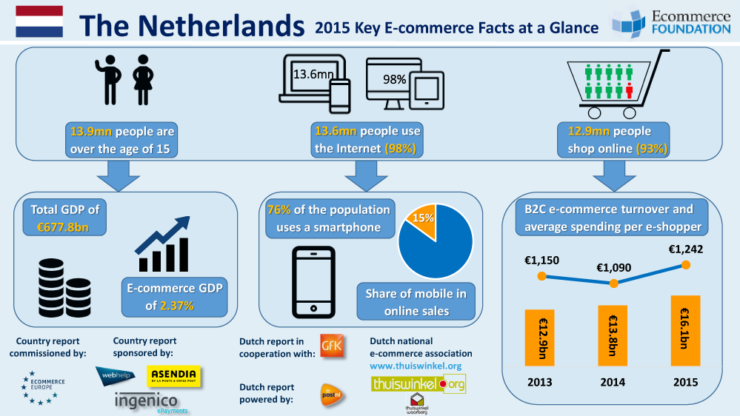 B2C Ecommerce sales in the Netherlands are expected to reach 18 billion euros in 2016. The ecommerce industry was worth slightly more than 16 billion euros last year, but according to the Ecommerce Foundation the online retail industry is expected to increase by 12.1 percent and thus reach 18.014 billion euros. This growth was mainly due to the fact the online spending on products increased by 22 percent compared to 2014. But cross-border sales also increased significantly, by more than 30 percent. And 23 percent of the Dutch bought at least one item at a foreign website last year. In total, there were 3.2 million Dutch cross-border shoppers, spending a total of 513 million euros abroad. For more info about the Dutch etail landscape, please visit our special page about ecommerce in the Netherlands.